I finally started something I have been planning for a long time – going through all companies listed on the Bulgarian Stock Exchange (BSE). So far I have only gathered summary information available on local financial websites investor.bg and infostock.bg. Not all companies are included on these websites. Getting summary information for the excluded ones means going through the filings of each company manually, which will take some time. But here is what I have so far. Virtually every public company has a majority owner. SOFIX – the major and oldest (est. 2000) index; free-float adjusted, market-cap-weighted index; consists of the most liquid companies with a market cap over $33.3m; currently includes 15 companies. 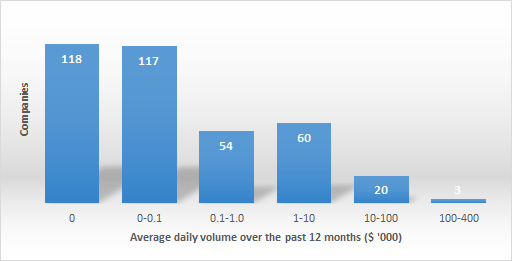 BG40 – the price-weighted index of the 40 companies with the highest volumes in the past 6 months. BGREIT – a free-float adjusted, market-cap-weighted index of the 7 largest, most liquid REITs. BGTR30 – a total-return, equal-weighted index, consisting of 30 companies. Year-to-date, the Bulgarian market has thrown up quite a performance with the SOFIX advancing 15% – 2.5 times the S&P 500 return. You can have a look at infostock.bg (available in English). This leaves a little over 370 eligible companies. If you would like to leave REITs (70) and financial and insurance companies (15) aside, you are left with something like 290 companies. The charts below should give you some feel for the market (372 companies). 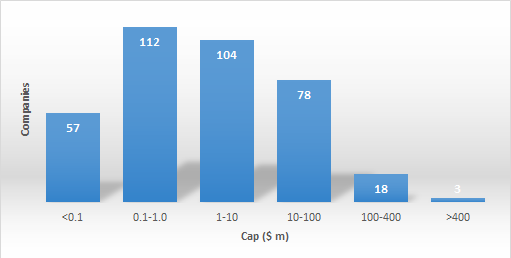 The bulk of listed companies have capitalizations between $100,000-$100,000,000. This is not necessarily good or bad in itself. What is troubling is the lack of liquidity. Nearly one-third of the listed companies didn’t trade at all in the past year. Another third traded less than $100 (one hundred US dollars) worth of shares daily on average. Of course, this will change as more capital flows in, but this will change the valuations as well. For all practical purposes, the currently investable universe is shrunk to 137 companies or less, depending on where you place the cutoff. Out of this investable universe, so far I have had a glimpse of 60 companies. 39 are selling below book value. 3 are selling below net net working capital. None are selling below net cash. In a following post I will go over these three net-nets. Meanwhile, I will scan the annual reports of the companies that are not covered in the finance sites.